With our ethos and commitment to ‘continuous improvement’ we have embarked on a change programme to enhance our performance, and have been accredited with SC21 Bronze status. 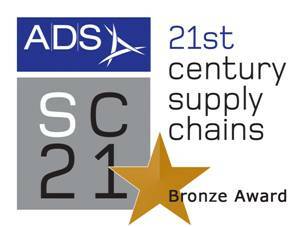 SC21 is a change programme designed to accelerate the competitiveness of the aerospace & defence industry by raising the performance of its supply chains (and it is supported by ADS – the trade organisation advancing the UK Aerospace, Defence, Security and Space industries). We will be applying SC21 principles to all of our customer base regardless of industry sector.